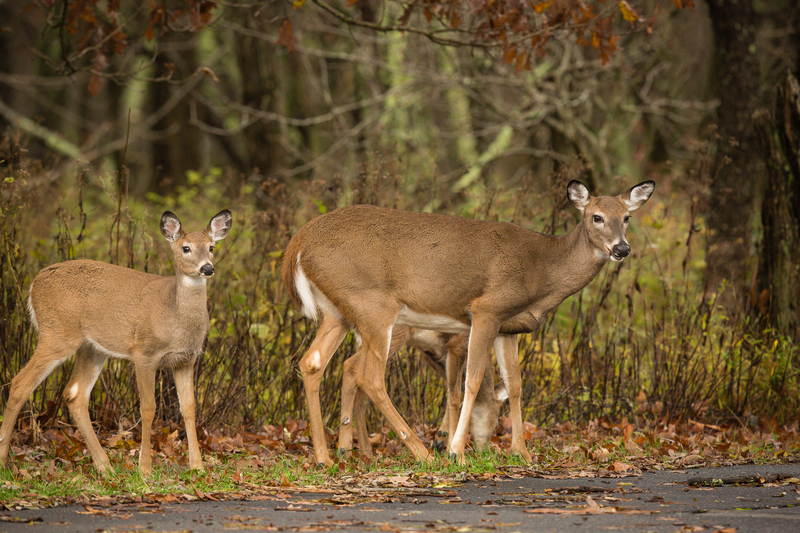 Shenandoah National Park is home to a large population of White tailed deer. 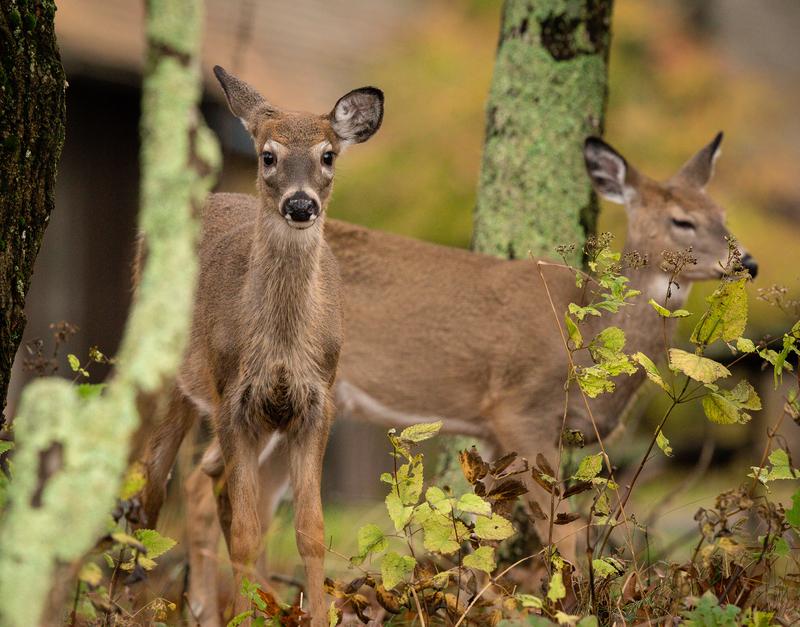 Within this protected haven, overtime these deer have learned to not fear humans without the presence of hunters. 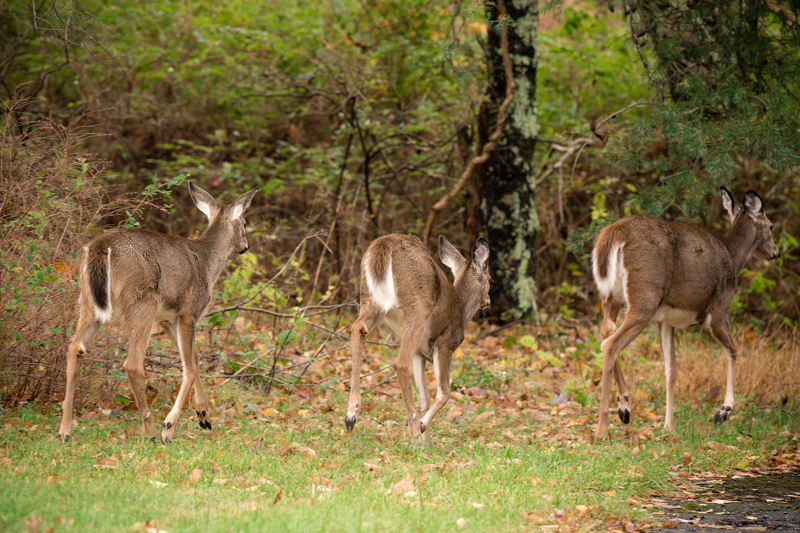 Along Big Meadows, the deer are easily found at dawn and dusk along the roadways leading into the lodge and along Skyline Drive. My visit to Shenandoah had to include some time with the deer, and while they can be found, one does need to look a little to find them. Driving down a dead end road that led to staff quarters, I found a doe and her two yearlings grazing gently along the woods. Setting up and enjoying the serene moment. The moment where one can be next to nature and my presence does not disturb. Becoming part of the surroundings, and perhaps a welcomed visitor to their world. They strolled gracefully by in the wooded area and the younger ones looked on with curiosity. Feeling no threat, they walked by so closely that I actually had to back up to capture a head shot. But then something else caught their attention and away they went. At least I had a few private moments with these beautiful Doe-see-Does. Anywho, these deer look so, so healthy! And wow your images are incredibly SHARP and CLEAR. I love it, and I’m jealous! 😉 Well done. That’s pretty sweet that you could get this close to them. When I was a kid we had a pet deer, sort of. When he got to be a yearling we let him stay outside and he’d come every day to get food. 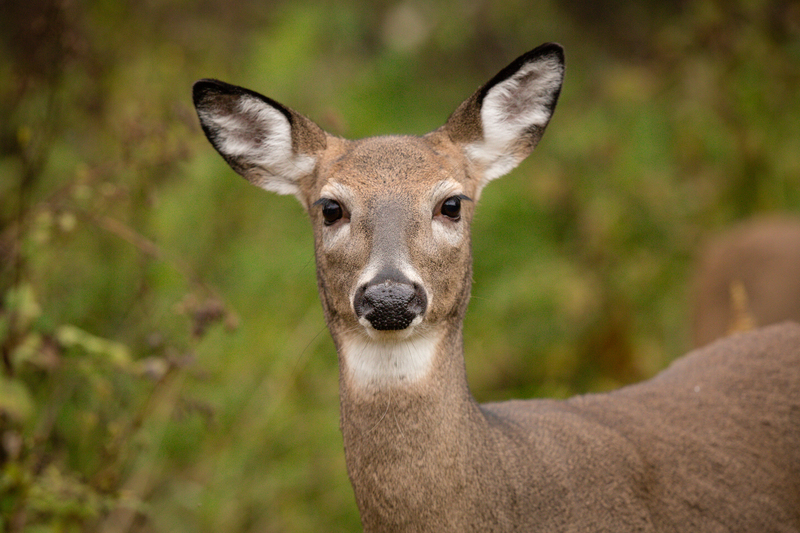 Then one day he never came back but I heard a couple years later of stories of a deer with a chunk missing from its ear (from one of our dogs, playfully) playing with people’s dogs! Not sure what happened to him overall given being a buck and all but he was a treasure in my life. Thanks for taking me back to those memories. It’s so wonderful to see you and I can’t believe the huge visit you paid me with such amazing comments. Truly your mastery at the written word is truly amazing. It does indeed to be close to them to get a sharper image. That and my super cool 500mm. LOL ! I can’t believe you got to have a pet deer. Now I’m totally jealous. I can only imagine what it was like having him in your live. Sort of like Marjorie Kinnan Rawlings “The Yearling” Where it’s a beautiful story that always has an unexpected ending. Love how you revamped your website – you are truly a pro now! Congratulations on a job well done. We named him Felix. It was a real treat to get to experience his personality. That and his attempts to play with the dogs, nature didn’t make them well-suited to be close friends, thus the chip outta his ear. Thanks on the website comment! So beautiful – wonderful shots. You are truly too kind Mary. I know you’d appreciate their special and gentle nature. It truly is Fatima, I can’t tell you how much I love spending time with these beauties. Thanks TK ! Love their huge brown eyes just looking at me with depth. Gorgeous photos!! I visited Shenandoah around this time last year and I was amazed at how little these deer care about humans and what we are doing. They just go about their business. And look so beautiful while doing it. One thing in particular stuck with me–I saw young little ones licking each others heads, like cats, it was soooo adorable! 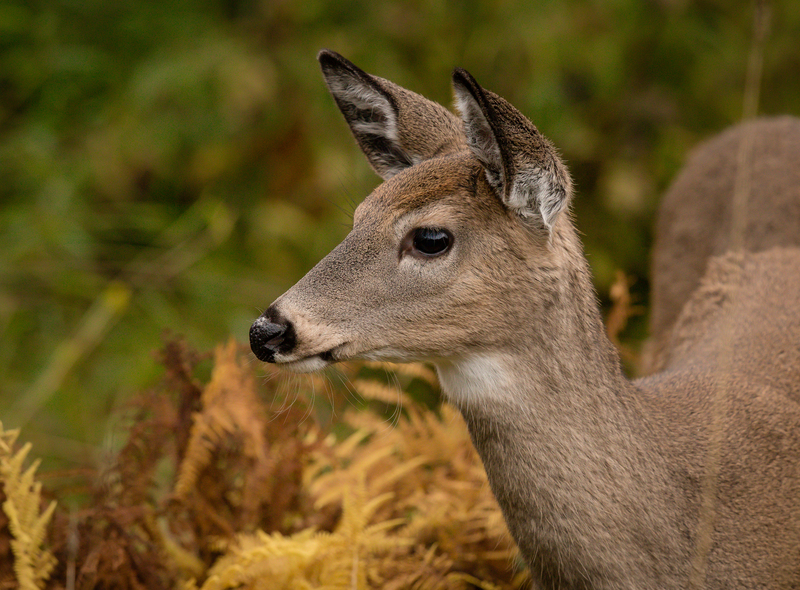 It’s such a joy to spend time with the Shenandoah deer. Thrilled you could experience it as well Lauren.